Alaffia: Where Are You Taking Alaffia this Summer? 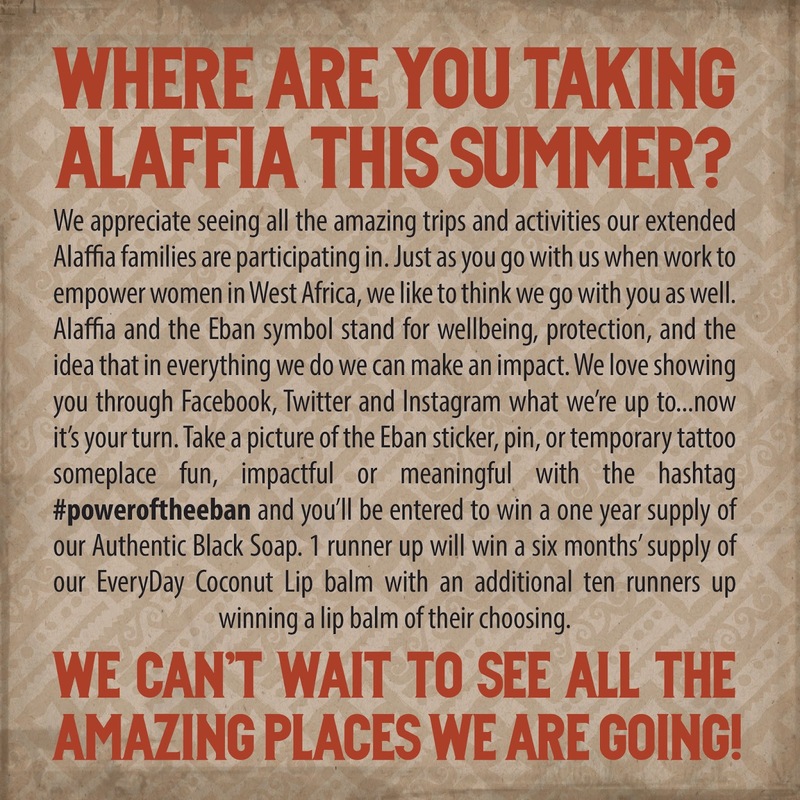 Where Are You Taking Alaffia this Summer? To request a sticker, pin, or temporary tattoo write us at community@alaffia.com with your name and address. Must be 18 years or older and provide a shipping address within the United States. Contest runs from June 25, 2014 4:00 PM PST – July 31, 2014 3:00 PM PST. Picture post on Facebook, Instagram or Twitter with the tag #poweroftheeban enters the giveaway. Winners will be selected by Alaffia's design guru, Ben Wilson (you can check out his work here). Winners will be contacted via Facebook message within 24 hours of the end of the contest. The winners will have 24 hours to respond to being notified of winning. If no response is received within 24 hours, a back-up winner will be selected, and will be notified. The same process applicable to the original winner will apply to all back-up winners. One second prize will win a six-month supply of EveryDay Coconut Lip Balm which equals one lip balm per month for 6 months.